I found a box of 45 800k floppies at a local goodwill the other day for $3. But my best find, ever was an Apple IIGS with a lot of cards in it for $10. A friend of mine found a iMac SE (600MHz) on the side of the road with nothing more wrong with it than a bad hard drive. It was very grubby so I have given it a good clean up and it looks great! The screen is a little burnt-in but otherwise it is a very decent little SE/30 and works perfectly. You scored! Good for you! And good for the lucky little Mac that now has a good home. I don't think I've ever picked up a find from a thrift store, yard sale, or the side-of-the-road. I once went into a Goodwill Store, but I didn't find anything. I think your chances are slim, but the payoff could be amazing! As for the best eBay find ever, I would have to say it was my $80 128k Mac in excellent condition. $80 is a great deal for excellent condition. I got a 128k for $50 on eBay last year, but it was misclassified, so no-one else knew what it was. I have to slap myself on the forehead though, because I sold it (should never have done it), but I got $200 for it. Many years back I picked up a lot of Retro Macs at thrift stores, or computer stores that just wanted to get rid of them. I even found a Apple II, I think it was given to me, but I didn't know how to use it. My sons school wanted computers, so I donated them. ARG! I could just kick myself know. But, I'm building up the collection again. 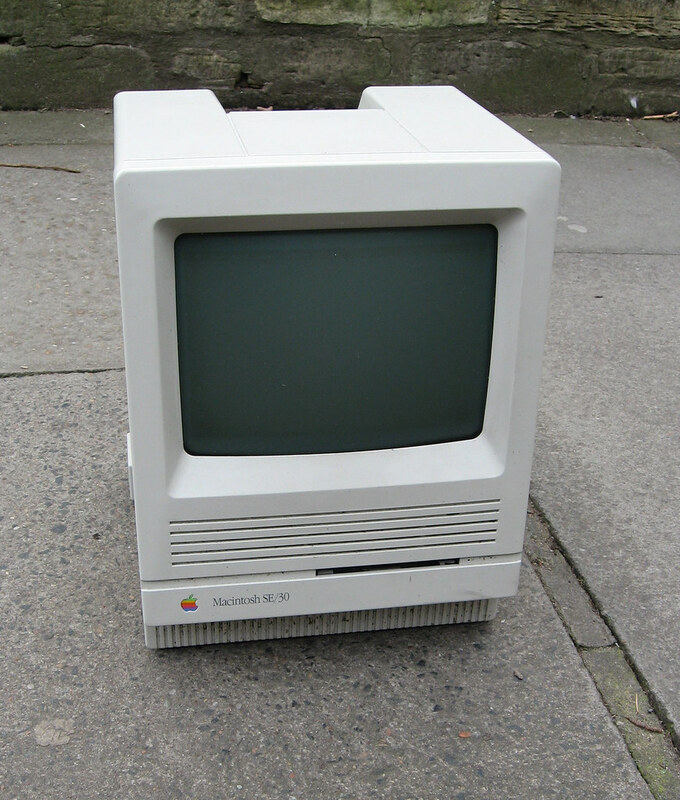 It use to be much easier to find Retro Macs in thrift stores, but I think more people are recognizing their value now. I think my best purchase was my TAM that I got on eBay for $325. I was the only bidder, and that one had me sweating for a week. I don't know why no one else was interested, maybe because it had the TAM speaker buzz, which I research and fixed. The base has a few scuffs, and one side of the CD door was broken in shipping, and the speaker covers aren't perfect. But, she's a nice, nice machine, and she sounds great. She and my CC are my favorites (I hope the others don't read this). I love them all. Really, I do......hey, turn the screen back on, no, don't spit out that CD! Stop erasing those files! I was just kidding! I meant-old Macs, those are my favorite old Macs. You're my favorite modern, shinny Mac! Shinny is good. A local forum frequenter noticed that I collect Macs. He GAVE me his "broken" 1GHz G4 Powerbook. He was right it was broken - the LCD interconnect is loose causing it to loose display. But for the sake of massaging the back of the screen every once in a while, it is a great machine! My most exciting thrift store story was finding a platinum coloured Apple //c composite monitor to match my Apple //c plus (which wasn't released here in Australia!) Couldn't believe I got it for AUD$5 - would have cost hundreds to import from the USA. Freecycle is the way I get old Macs. I snagged a Bondi iMac, a 6600 DOS-compatible with monitor, and a PowerMac G4 DP500 in the past two years, plus several others that I fixed up and then passed along. The thrift stores around here always have obscene prices on their Macs. G3 iMacs are not worth $250. And then they tell me they don't like Macs because they never sell! I couldn't agree with you more! And it's not consistent. I bought a complete (including keyboard and mouse) iMac DV 400 (Strawberry) for $20 at Goodwill a few weeks ago. The next week I went to an independent (but large) thrift store, they have 3 iMacs sitting there, no power cord...no keyboard..no mouse and the prices are from $99-$129. They are all 500mhz and above...but still, how do you "check it"? And no refund policy? I've tried to reason with them, but you know how it is, they have some "pricer" who pulls up the price off the top of his or her head. It's not based on market rate at all. Don't they realize they'd make more money by selling cheap? It's not like they paid for the inventory, right? And having a dinosaur sitting on the shelf doesn't make money. I think the best find that I ever had was in about 1998 when I visited a thrift store in my neighborhood that I visited just about each week. They normally didn't have anything interesting, but this one time, I saw on the shelf . . . a Canon Cat is excellent condition, with it's matching printer! For anyone who doesn't know, this was the computer designed by Jef Raskin a few years after he left Apple in disgust when Steve Jobs forced himself as chief of the Mac project. This computer was essentially what Jef had had in mind as the Macintosh - Canon Cat. It was very cool and such an awesome addition to the Apple-centric part of my collection. Unfortunately, like a number of my other highly collectible machines, I ended up having to sell it on eBay to raise money. Unfortunate for my collection, but fortunate for my family, as the "set" sold for around $800 at the time! Later that same year, I also had to sell a real prize of my collection too - an excellent condition IMSAI 8080 with a number of great cards in it and documentation, etc. - IMSAI. Again, unfortunate, but that $2500 repaired the transmission in our family car and helped finance my family's move from Florida to Virginia at the time. Yep, that was the most I ever sold anything for on eBay. That time period was also the height of the old computer collecting boom on eBay too. Ah, pre-dot-com bust. Wow! That is a find! How did you come by the IMSAI 8080? Was that a thrift store find too?